The night before Passover, there’s a traditional Jewish ceremony called Bedikat Chametz. Bedikat Chametz means “checking of chametz” and it has to do with making a last check for all the chametz in the house. That’s the stuff we’ve been cleaning out for the last month – all the products of the five forbidden-for-Passover grains: wheat, barley, oats, spelt, and rye. By the last night, there shouldn’t be any left, but the traditional thing is to save a bit back so that you can “find” it and destroy it. I have a half-package of fettuccini pasta waiting for bedikat chametz at my house. Now I’m waiting for sundown – traditionally, 40 minutes after sundown on the evening before Passover is the proper time for it. Traditionally, you take it outside and burn it. I live in fire country in California, and even in the springtime, my neighbors would rightly call the fire department if I started a fire outside. So I put the last chametz in the compost can, which technically isn’t mine – it belongs to the city. I thereby move it off my property, outside my domain. All leaven and anything leavened that is in my possession, whether I have seen it or not, whether I have observed it or not, whether I have removed it or not, shall be considered nullified and ownerless as the dust of the earth. And once I’ve done that, any chametz left in my house is inedible trash. We’re almost there: Countdown to Pesach! Posted on April 21, 2016 April 21, 2016 Categories A California Jew, PassoverTags bedikat chametz, ChametzLeave a comment on What is Bedikat Chametz? Posted on April 20, 2014 April 20, 2014 Categories Ask the Rabbi, PassoverTags Ashkenazi, Chametz, kitniyot, Passover, Seder, Sephardic5 Comments on Ask The Rabbi: How are Sephardic rules for Passover different? Once upon a time, I was a potter. I spent all day, every day, covered in clay. My coveralls were coated with clay. My fingernails had semi-permanent deposits of clay. My account books (this was in ancient times, before personal computers) had little daubs of clay punctuating the neat double-entry accounting. I had clay in my eyebrows, for crying out loud. But I did not feel a bit dirty, because it was CLAY! In the pottery, the whole dirt/not dirt thing was flipped on its head. Clay was not dirt. Clay might get dirty, contaminated by some stray item (a bit of plaster, or my lunch) that fell in the slurry bucket, but clay was not dirt. In the home where I grew up, a bucket of clay was a bucket of dirt. In the studio, the same bucket of clay was a precious raw material that had cost good money or hard effort. Dirt, on the other hand, was stuff that was out of place or out of control, or both. Bits of plaster were especially dirty, since they could cause a pot to explode in the kiln. However, plaster that stayed where it was supposed to be, in a drying cast, was a good and valuable thing. I learned, in the pottery, that what is “clean” depends on context. It is a designation that depends on the rules of the context I am in at the moment. The experience of running a pottery was a perfect setup for Jewish thinking about “cleanliness.” Whether it is ritual cleanness (“tahor”) or ritual uncleanness (“tamei”) or cleaning for Passover, it’s all about context. All the grain products in my house have a use-by date of 13 Nisan, the day before Passover, because after that date, it all becomes dirt. Tonight we are going to have pasta for dinner, while that pasta is still clean – on 14 Nisan, it will become CHAMETZ, and it shouldn’t be in the house (DIRT!). One way to get rid of it is to eat it up before Passover. Another is to give it away. A third possibility is to compost it. A fourth possibility is to destroy it or sell it. Whatever I do with it, it must be gone before Passover. This goes for all grain products: anything made of wheat, barley, oats, spelt, or rye. Chametz includes liquids like beer and whiskey, foods like pasta and cookies, even the processed foods I keep for convenience in the cabinet. It all has to go, because after 13 Nisan, it’s essentially dirt. The stuff I normally see as dirt also has to go, because it might have chametz in it: dustbunnies, dust, crumbs, the shmutz on the tile backsplash behind the stove, all of it. 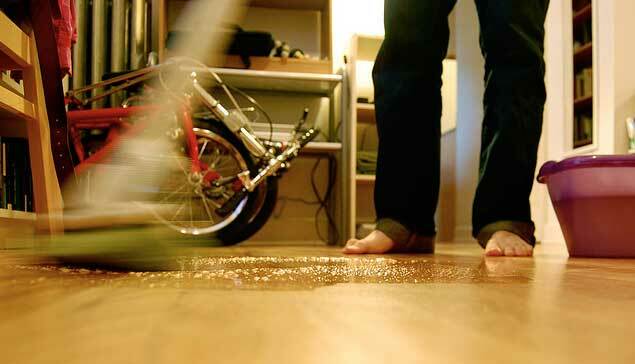 This is the original deep spring cleaning: get rid of all the chametz! Get rid of the dirt! Right now, my house is full of chametz, perfectly harmless at the moment. I have a week to get rid of all of it before it turns to dirt. Pardon me while I go CLEAN! Want to join in? We’re sharing #BlogExodus for the next 2 weeks. All you have to do is use the hashtag and there are suggested prompts on the graphic above (feel free to grab it). 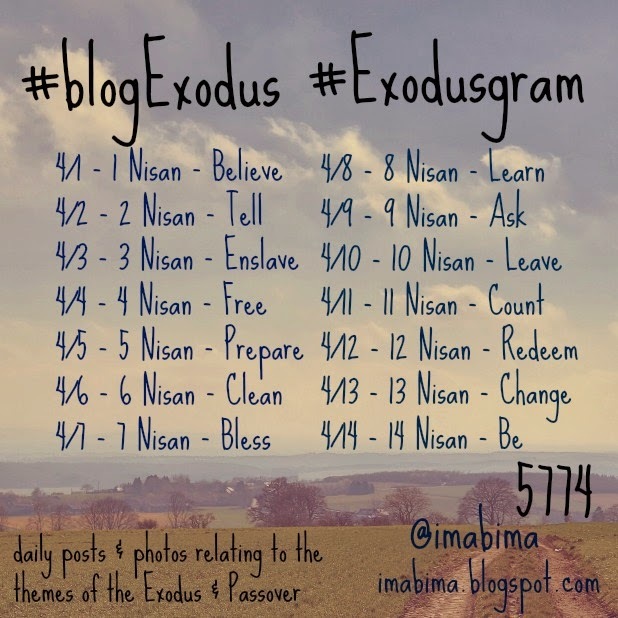 Maybe you just want to post on your Facebook or Twitter about these topics…or maybe you want to try #Exodusgram, posting photos related to these themes? I am late to the party but I’ll be posting my #blogExodus posts here from now till Passover. Many thanks to the clever rabbi who started this pre-Passover celebration of words and images, Rabbi Phyllis Sommer, who blogs at Ima On and Off the Bima. 1. 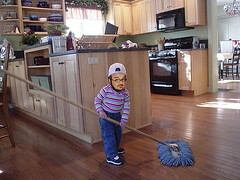 HOUSE CLEANING. Yes, literal house cleaning! For more on this, and a sane way to approach it in the spirit of learning something (as opposed to merely making yourself exhausted and crazy) here’s an article I wrote last year. One of the things about the physical cleaning is that you can pursue it while you think about some of the more brain-intensive possibilities below. 2. PONDERING A PERSONAL PASSOVER. Passover is the festival of telling the story about “deliverance from Egypt.” If you are truly to experience deliverance, it helps to notice from what you need deliverance. Spend some time, between now and Passover, thinking about your own personal Egypt(s). The name for Egypt in Hebrew is “Mitzrayim,” which also means “a narrow place, a tight spot.” Questions to ask myself: Where in my life am I stuck? To what am I a slave? In what parts of my life am I Pharaoh? Do I depend on the slavery of others? What would freedom look like, in any of these cases? What would freedom cost? What is freedom worth? 3. PLANNING FOR SEDER. Notice that I don’t say “planning A seder.” I covered that last year in the post, “Seven Things to Do to Make Your First Passover Seder a Success.” The question is, what am I going to do about attending seder this year? Participation at seder is not optional: Jews are supposed to be at a seder the first night of Passover (in some understandings, the first two nights of Passover.) This does NOT mean that each of us have to host a seder, however. Now is the time to make seder plans, to touch base with the family with whom you always have seder (are we observing together this year?) 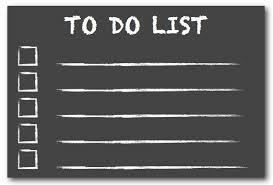 or to make your own list of guests, or to find out what’s available to you. If you are reading this and thinking, “But I don’t know anyone!” then you need to get busy. Phone your synagogue and tell them that you need a seder invitation (yes, this is perfectly OK, if you belong to a synagogue.) OR phone almost any local Jewish organization and ask them to point you to a seder you can attend for a fee. If this makes you feel incredibly anxious, watch for upcoming posts on this blog about being a seder novice with “nowhere to go.” I’m going to write about it. 5. PONDERING CHAMETZ. Another thing to think about, as Passover approaches, is chametz. It’s what we clean out of the house (see the link in #1 above.) Technically speaking, chametz is any product of the five grains (wheat, barley, rye, oats, spelt) that may have gotten wet. (What? you say, I thought it had something to do with leaven? And the answer to that, is that in Bible times, leaven was all by sourdough method: if grain got wet, sometimes it got infected with yeast and swelled.) 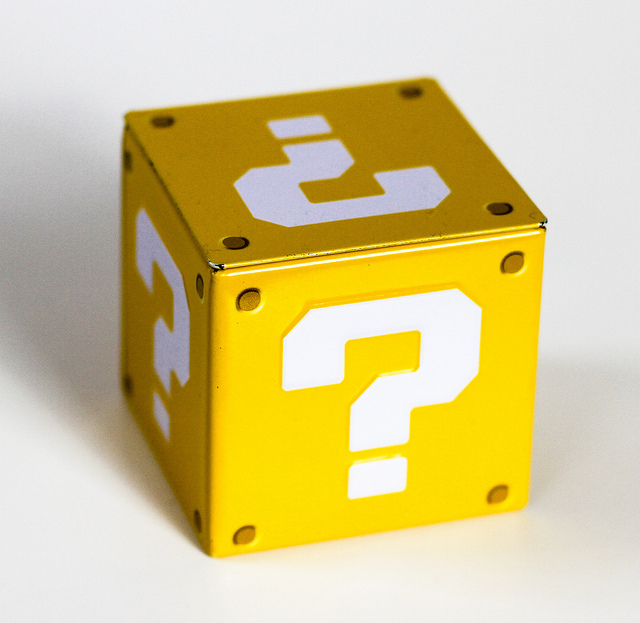 In pondering chametz, the questions are: what in my life is crummy? What has gotten swelled up, out of proportion? What is stale? And now that I’ve identified those things, what am I going to do about them? 6. TZEDAKAH. Tzedakah is the Jewish term for charitable giving, which we are commanded to do. At Passover, the story reminds me of slaves and refugees, both of which the present world has in miserable quantity. This is a great time to give tzedakah to relieve their suffering. This, too, takes planning! So, enjoy your planning! Get all the “juice” out of this fruitful time of the Jewish year! To whom or what am I a slave? The question is on my mind as I clean for Passover. The evidence lies before me, in trails of crumbs. There is chometz by the computer. What is a slave, if not someone who cannot rise from her task long enough to eat a meal? Is that addiction to work, or addiction to mindless wandering on the Internet? Addiction to netflix or addiction to facebook? Make a note and find out. There is chometz in the car. Again, I could not stop to eat like a civilized free person? My addictions/slaveries are writ large on the kitchen shelves: I buy processed food for “convenience” but the question is, does it nourish? Some does, some does not. A free person would have the time to find out. That is, if she were truly free from her addiction to the tastes of processing: sugar, salt, and who knows what unearthly thing from the likes of ADM.
Then there is the source of all this bounty I am pondering: where did my food come from this year? Did I enslave anyone, or benefit from their slavery? Did the crunch in my salad come cheap because someone else was in chains? Passover is about the passage from slavery to freedom. The question is, Will I make that passage to genuine freedom? And whom shall I bring with me? This post is part of the Blogging the Exodus project. A group of rabbis are blogging from the 1st of Nisan to the beginning of Passover on Passover topics. If you want to find some great rabbinic blogs, or some interesting things to ponder as you clean up the chometz, you can locate those blogs via the Twitter hashtag #BlogExodus. Posted on March 28, 2012 March 12, 2015 Categories Passover, The Jewish YearTags Chametz, Exodus, Passover, Pesach, Slavery, The Jewish Year4 Comments on Am I a Slave?